The competition on Saturday night was officially over, but we still have conscientiously received visitors, but at night we finally put an end to the music, we go girls and boys go home, for which our parents and friends certainly at least as happy as for our success. After the summary of the decathlon on the first place we find the team CANOPEA, the second the PATIO 02.12 and the third is Med in Italy, after them Odooproject was the sixth in the row. One might mockingly say that this place is just fine, because it is not so much at the end, not so much slipped from the first 3′s podium that we compulsively need to explain our prize.. but talking seriously: we really feel that we won. As for the sixth place – especially the three podium places in different probes- we are extremely happy. 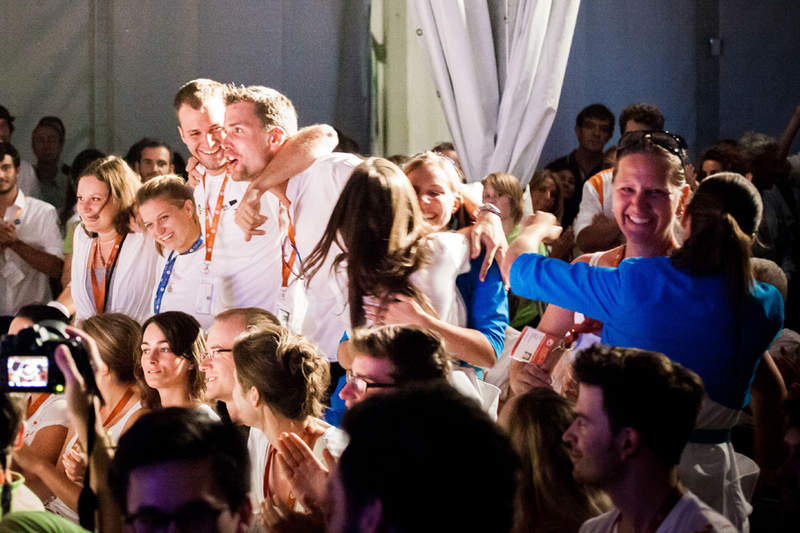 Here, look at the pictures: it seems that we won and we are happy for it? Yes, of course! We have also won with only being able to particiapte in the competition and deliver our house. Try to think so, try to recall how many times we felt that this is not going to happen and sometimes by the circumstances and possbilities forced us to ‘cry’. So we wouls happy only for the fact that we transported our hosue to the site, built it many times and the Odoo worked! We won, even in the field we didn’t. Remember that this is – even where we from – almost a completely new area, unknown, yet to be explored prairie, where we are those brave pioneers who take the first bold steps. Here, this competition is not about who can best learn and give back basic knowledge, you have to figure out things that nor anyone who has ever found found, nor anybody put the pieces together before so functioning whole as we do. By some results our method and technology was verified, in some standard we were among the best of all teams. We where didn’t reach a good place now we know what or how to improve. Also – and this also would be a shame not to tell – there were subjectively juried competition points, and sometimes we felt that we should have gained more points (what a surprise, right? :)), also, other competitors praised our design and indicated that we should have claimed a better result at the end. Politely bow our heads before the jury, and here we won, because we have learned to accept that sometimes it does not work, if we do our best to put them. 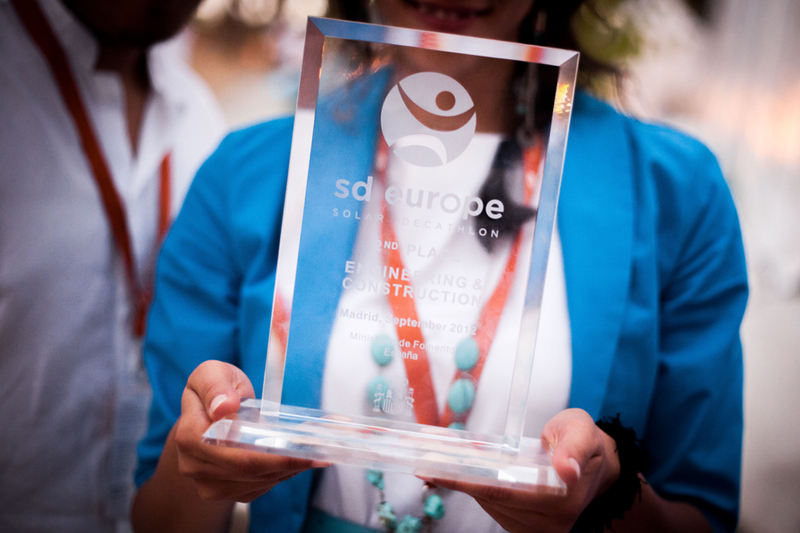 Meanwhile we proudly advertise our 6th place on the Soalr Decathlon Europe 2012! The jury of this contest, have evaluated the territorial strategy, the quality and the appealing of the architectonic design of each house, it´s coherence and most important, the combination of comfortable and functional spaces with technologies and bioclimatic strategies that reduce the energy consumption. For instance,among other specific aspects the use of artificial and natural light has been evaluated. They apprecieted in general houses responding the questions of dense urban integration, so the French CANOPEA won this contest with a house vertically elongable and designed with high quality details. They were followed on the 2nd place by the German team from Aachen, the 3rd was the Med in Italy team, Odoo reached the 8th place. In this contest we got the ‘silver medal’ – which is a glass prize- and we slipped from the 1st place just with 3 points! So the 1st one was the German ECOLAR HOME, and the 3rd is the Andaluzian team with the house PATIO 2.12. In this contest we showed the jury engineering technologies and standard of the Odoo house, how it was designed and implemented. So it’s proved that we had planned in the functional point during the competition it worked, as simulated in the design phase. Transportability of the house, the building’s structural specialties, mechanical and electrical innovations with a compact operating system, which so impressed the jury that awarded us a 2nd prize. In the energy efficiency contest we were trying to convince the jury considering several levels that: they were presented those passive design solutions that are already in the planning stage for future energy-efficient functioning. The goal is not to produce more electricity, but also to reduce consumption as well as the production and consumption need to be coordinated properly – our automation system will always be able to choose when each system is activated or turned off. The solutions are based on these principles have taken us to the podium: we were tied with the German ECOLAR on the +rd place. This contest was won by the PATIO 2.12 Andalusian house, and the Romanian PRISPA took the silver medal, in particular, for the success of our neighbors we were happy! This contest evaluates the houses’ capacity for electrical self-sufficiency over a whole year. Houses should reduce consumption to a minimum and produce electricity in quantities equal or greater than their consumption. The contest is divided into three sections which examine the electrical self-sufficiency of the house, the time correlation between generation and consumption, and consumption per unit of area. Evaluation is made on the basis of results obtained from bi-directional electricity meters installed by the Organization in each of the houses, but in the 1st year of the design phase this rule was different, so we sadly saw that we reached only 14th place. This monitoring contest podium results are: 1st Canopea, 2nd Patio 2.12, 3rd Med in Italy. This contest evaluates each house’s capacity to maintain environmental conditions (temperature, humidity, acoustics, air quality and illumination) suitable for the comfort of its inhabitants. Evaluation is made on the basis of results obtained from sensors installed by the Organization in each of the houses and also from an acoustics trial. 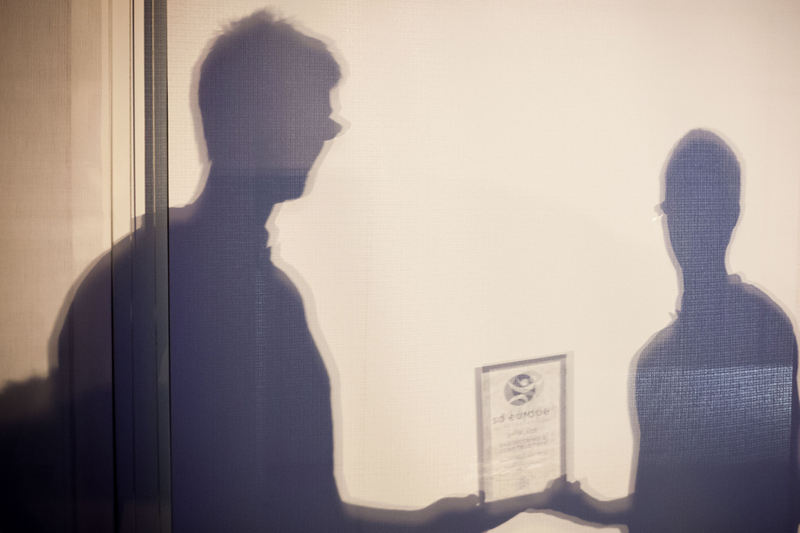 The rigirouse air condition control brough us to gain the 2nd place at the closing ceremony of the SDE 2012, obtaining another glass prize. Results: 1st Canopea, 3rd places: the Chinese Tongji team. During the 2 weeks of the competition we had to use various household appliances, with rules and scheduled timelines. For example, I had to start a washing program with 6 standard towel, during the wash water temperature had to reach 40 degrees, then the towels had to dried and then measured the mass of the dry towels down, so that demonstrated that it had no moisture. As the competition for success not only depends on us, but the number of household appliancies and on dynamically changing competition rules. 11th place. 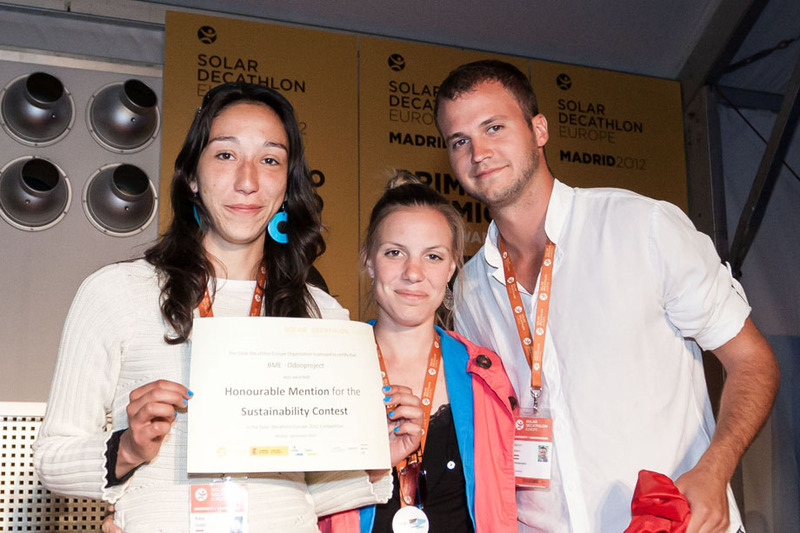 The Solar Decathlon competition’s main objectives to promote sustainability and the awareness of renewable energy sources. This is the competition where Andalusian team (PATIO 2.12) won the 2nd place team is the Rhone-Alpes Canopea, shared 3rd place in the WTH Achned and the Med in Italy team. The Odooproject reached 11th. We must frankly admit that at this point we are not very competitive entrusted to victory. The jury should have adopted and consider whether our house is not so, in the finished form fitted in injection molding as a template for a series production machine, but a lot smaller and larger part of the solution could be easily transferred to and inserted in our more typical custom-designed houses . The winning German team, the ECOLAR, especially the runner-up French Canopea, a house of this competition point in terms of really great solution, but since we do not explicitly popular prefabricated, modular, 8-10 storey high can build houses, therefore, we tried to design something that the domestic conditions can be functional. Unfortunately, our argument did not convince the jury of the competition at this point so we are only 11th place at the end. The topic is quite complex, even more reviews of: the individual contests’ juries in their category were assigned a score depending on how much they found a house in their category innovative. Our team has finished in 7th place, in one of the most mysterious category: at the closing ceremony the contest was not really evaluated and found to result in the form of a score and ranking. Of sustainability the various professions think quite differently, therefore Odoo ranks of students in different disciplines representatives of different viewpoints come and lengthy shared understanding of the principles, opinions kneading slowly evolved to a common vision at all about sustainability, about the nature. For the jury we highlighted the common thinking, the importance of awareness, we hope that the Odooproject has affected the engineer education in our country, as an excellent starting point toward that more people browse the roads are in a more sustainable building technologies that led to discovery. 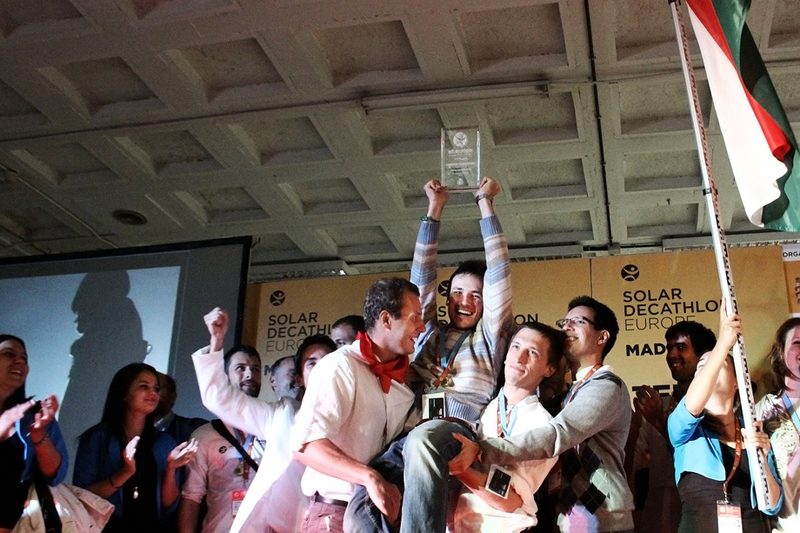 In the contest Med in Italy reached 1st, 2nd was the the Andalusian, 3rd was the Brazilian Eco-house. We did not nothing wrong, very nice score: we finished as 5th. If all of these wouldn’t be enough, there were several out of contest awards. 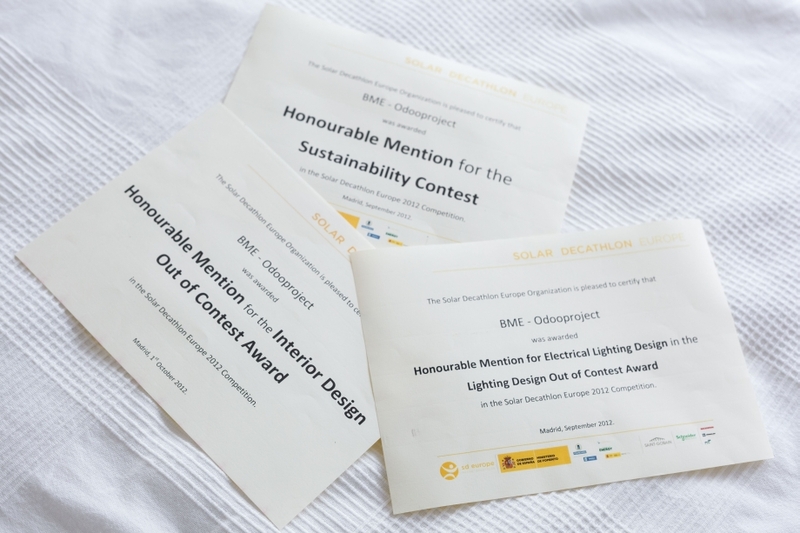 As they couldn’t leave us without a greetings for sustainability, they appreciated our interior design and lighting with an honourable mention on these awards. 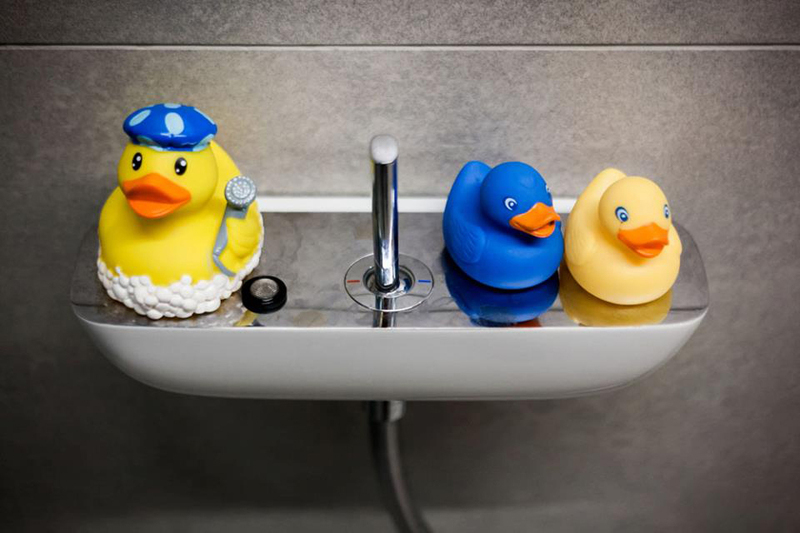 For the cheering we must thank our family members, friends, all our sponsors and supporters, fans and followers, and last but not least the rubber ducklings. For detailed results check the competition’s monitoring site! Háromszoros nagy-nagy ÉLJEN!!! az egész CSAPATnak, gratulálunk a szép eredményhez! Gratulálok a Csapatnak! Büszkék vagyunk Rátok! És köszönjük szépen a részletes leírást! Ugyanis nem volt mindig egyértelmű számunkra az egyes próbák szakmai tartalma és a zsűrizés szempontrendszere! BÍZOM BENNE, HOGY A SAJTÓ, ÉS NEM CSAK A SZAKSAJTÓ IS ÍRNI FOG AZ ESEMÉNYRŐL, RÓLATOK, A JÖVŐTÖKRŐL!!! Talán Ti is olyan csapat lesztek, mint korábban Markó Iván osztálya volt, akikből lett a Világhírű Győri Balett? Kivánom, hogy így legyen!! Büszkék vagyunk rátok!!!! Jó volt látni, hogy nem csak felvettétek a kesztyűt, hanem rajtatok is volt végig, és nem engedtétek kiütni magatokat a ringből :-)))) Egyik kategóriában sem voltatok utolsók, volt olyan bírálat amiben a győztes csapatot is jócskán felülmúltátok. Még két dolgot kiemelnék, a “laikus beleolvasóknak” :-) amire a cikkben gondolom szerénységből nem tértetek ki. 1-Ezt TI a két kezetekkel építettétek fel!!!!!! Amit nem minden csapat házáról lehet elmondani. Köszönjük a munkátok menetét tudósító képeket, videokat,beszámolókat, amik nélkül igazán el se tudtuk volna képzelni mit jelent ez a verseny. Mi is szeretettel és nagyon -nagyon várjuk már a csapatot haza! Eszméletlen. Gratulálok! Tapasztalatból mondom, hogy az egyetem nem arra készít fel, hogy kikerülve képes legyél valamit egyedül végigcsinálni. Egy nagyon jó alapot ad, de arra diplomaosztás után még rengeteg téglát kell hordani. Nektek a falazat már most kész, óriási gyakorlati pluszt adhatott nektek ez a munka. Minden elismerésem. A MOGI tsz. nevében is gratulálok!!! Gratulálunk az egész csapatnak! Jó pihenést! Gratulálok a csapatnak, fantasztikus eredmény! Nagyon-nagyon, és nem győzzük elégszer, ismét és ismét megköszönni ezt a sok dicséretet, gratulációt és felénk áradó szeretetet. Mindez olyan motivációt és olyan többletenergiát ad, ami nagyban hozzájárul ahhoz, hogy újult erővel fogjunk hozzá nap mint nap az újabb adag Odoozáshoz. Sok-sok gratuláció a csipet-csapat minden közreműködőjének. Nagyszerű gondolat volt az összefoglaló (élménybeszámoló) megírása, és közzététele. Nem tudom mi lesz a sorsa a háznak, meddig lehet a helyszínen megnézni, és ha elbontódik akkor valyon felállításra kerül újra itthon, Magyarországon. Még egyszer gratulálok a sikeres projekthez, az elért eredményekhez. Gratulálunk!!! Nagyon büszkék vagyunk a csapat minden egyes tagjára. Nagyon sok sikert és elismerést kívánunk mindnyájatoknak az életben.